If you want to get a whiff of the actual bistronomy buzz then it's time for you to go to Brussels and give this resto a try. It's located in Saint-Gilles, Brussels, on the busy Chaussée d'Alsemberg just in front of 'Café des spores', the renowned Brussels resto specializing in dishes with mushrooms of all kinds. 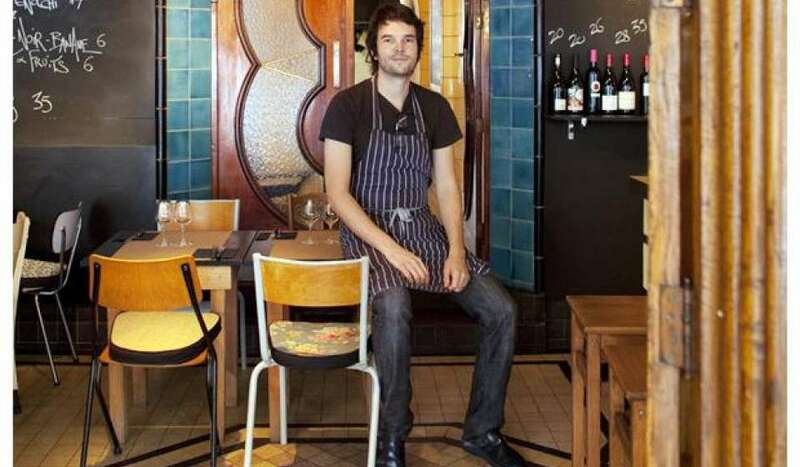 This location is no coincidence as both resto's share the same owner, Nicolas Scheidt, a young entrepreneur with his roots in the French Alsace region. Though he has a background in law school he never put it to use but opted to make a career out of his passion, good food. After having worked at London's 'Bellamy' and 'Jamie Olliver's 15' he opened a bistro in the centre of the gastronomical capital,Paris, named 'L'office' and later took over 'Café des spores' and opened 'La buvette' here in Brussels. It all adds to what you get now in 'La buvette'! A simple, laid back yet very original setting -an old butchershop- the pending meathooks are the remaining witnesses of the former use of the house together with the typical butchershop tiling, and a culinary experience at high level for a 'bistro'-price! And after a a couple of reviews by colleague good food lover/blogger Be-gusto we knew we had to give this place a go! Service is without ceremony, friendly and easy, welcoming. A couple of young waiters take care of the service together with the chef's explaining the dishes with passion. The young waiters are somewhat unexperienced and clumsy but were allways correct when asked for info. Fun thing is that we were actually seated in the cooling area where they used to hang and keep the meat. There's only one set menu available, 7 dishes for 45€ with the option for cheese for 7€ and a slow coffee for 5€. Bistronomical prices! They also have an impressive wine and beer menu, the collection of beers they offer really left an impression on me and I opted for a beer as an apperitif, a 'Saison de Dottignies' from brewery 'De Ranke', a smooth unfiltered white/blond beer. Amongst the wines a couple of beautiful natural wines, we tasted a good fruity/mineral Riesling and a special Pinot noir from the same house, Rieffel, which tasted very candy like, warped me back to my childhood. No appetizer is served and the first dish came while we were still enjoying our drink. Different structures of kohlrabi with bergamot and a Cecina crumble. A preparation served cold, very refreshing and crisp with some smokey flavour from the Cecina crumble. Next came a ravioli with a savoury black pudding sausage filling swimming in a delicious, strong yet balanced pork&chicken broth. Some braised spinach and toasted buckwheat on top. A moist and flakey piece of pollock, a hearty reduced bisque as sauce and a potatoe cream with sepia ink. The fish was cooked perfectly, the rich flavour of the bisque elevated the fish and the potatoe cream with sepia ink harmonized the whole nicely. Texture wise the potatoe cream was a bit weird but taste was good. Our fourth dish was probably the winner of the evening, a laquered piece of veal(shoulder I think) combined with a rutabaga cream and some rumex(zuring in Dutch) leaves. The veal had a sweet taste, so did the sauce, and was tender like butter - no knife needed- and countered perfectly with the earthiness of the rutabaga cream. Nice! At this point we had an intermezzo with some cheese. A nice selection of refined cheeses(from top, clockwise) 'St-Nectaire' 'Tomme de Chartreuses', 'Etivaz' and 'Fourme d'Ambert'. My personal favourite was the Fourme d'Ambert, a deliciously strong and salty blue cheese. One of France's oldest cheeses. After the cheese we had our first dessert, a combination of fresh 'Faiselle cheese ', mango, pumpkin, spiced meringue and caramel cream. Unfortunately this dish didn't work. I was expecting something refreshing, giving a nice tangy contrast but it lacked harmony. The different elements didn't blend well together leaving us dissapointed. I had a similar dish a week before at resto 'Veranda' in Berchem and there it was spot on so I knew what I was missing here! Too bad! Luckily for us we weren't done yet and the next dish hit the sweet tooth in me! Chocolate heaven ;) A chocolate tart covered with a praliné demi-sel crackle and a chocolate/praliné quenelle. More of this please!! Last dish ended on a refreshing note (as it should in my opinion), a lemon icecream covered with a light white chocolate sauce and a kardemon/cilantro syrup. I didn't really notice the cilantro and the lemon was a bit punched back by the white chocolate but it was a good refreshing ending. And when you order a coffee here don't ask for an esspresso or latte-frape-machiato! You might end up banned from this place(so is asking for a coke apparently), they take their coffee seriously. You can choose from a couple of origin beans, all roasted in Belgium and then prepared following the 'slow coffee' principle. And I must say they make one hell of a coffee! Very nice experience in this bistronomic resto in Brussels but I must say that my recent visit to 'Veranda' had left me a with better impression of what bistronomy is all about. Very good effort though and I wouldn't mind a second(or a third) visit!